I met an old friend and his lovely wife here for lunch today. As a fellow foodie, I had total trust in his choice when he said it’s one of his favorite neighborhood spots and the many excellent reviews I found online confirmed his great taste. Walking in and seeing Anthony Bourdain sitting at the table next to us cleared up any chance that this wouldn’t be a great meal. 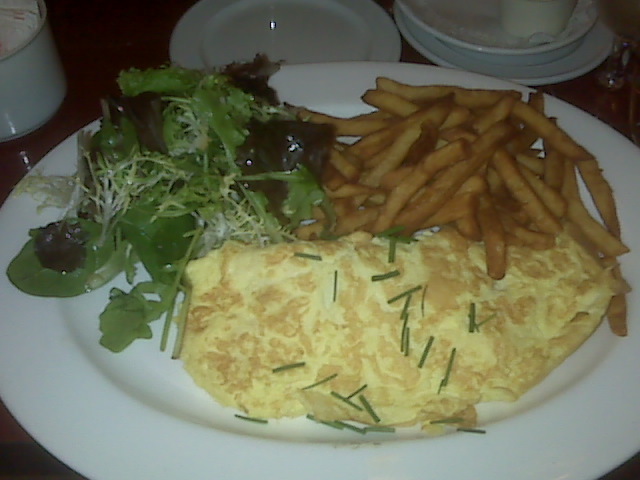 I ordered the Omelette D’alsace which was filled with mushrooms and comte. It was cooked beautifully and even though I was stuffed after half of it, I managed to clean my plate. Light, fluffy eggs, juicy mushrooms and the perfect amount of melted cheese. The fries arrived well-done per my request and were crunchy and perfect, not too greasy. The side salad was lightly dressed with a balsamic vinaigrette and a refreshing complement to the heavier foods on my plate. I sipped a delightful lemonade and took in my surroundings. 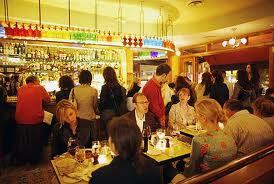 Brightly colored seltzer bottles circled the bar, a hoppin’ UES crowd of all ages filled the tables. The noise level was a little louder than I like- but overall it was a fantastic lunch and I’m sure I’ll be returning!